Earlier this month I finally got a chance to go to Lagos, Nigeria. It left an indelible mark in my mind. Lagos is a gorgeous city, intoxicating and yes, a little gritty but all in all completely intriguing. Intriguing in its scale, its people, and its location. Free flow of thoughts below on what I learned and observed. You can either experience the Lagos of possibility or of gridlock. It depends on your mental frame. One of the hosts told me that you can attract your own Lagos. You just need to bring an effortless and authentic personality. Being in Lagos, I was quite encouraged and happy to see the forward momentum in service provision, infrastructure and even waste management. I was part of a small group that was given a tour of the Bus Rapid Transit (BRT) system complete with NFC technology for easy payment. The BRT system moves Lagosians quickly through the city in a very efficient manner. The fleet I saw was impressive, not in the shiny super new kind of wayâ€¦more so in a functional, well maintained somewhat old fleet, yet orderly kind of way. The investment in infrastructure is continuing, with a new light rail system that is on course to be opened in 2016. 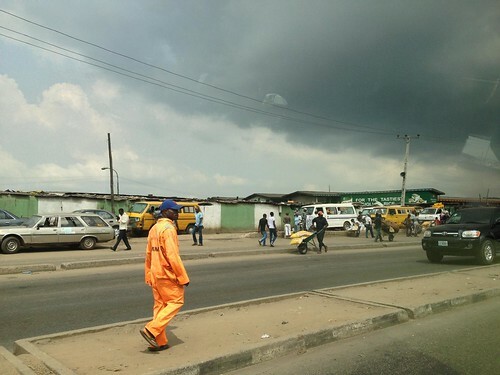 As you make your way around the city, there are people with orange coats emblazoned with LAWMA. This stands for Lagos Waste Management Authority, which is ensuring that the city is cleaned up and waste is processed. Clearly there is order from the chaos you thought Lagos was wrought and overrun with. The infrastructure of the mind: This is a key idea that I encountered when Moji Rhodes gave an overview of the efforts by the state of Lagos to not only improve the lives of Lagosians, but to empower them. As is similar in most parts of Africa, there is no escaping the colonial baggage that saddles culture, inefficient legacy systems, land allocation problemsâ€¦the list can go on and on. The infrastructure of the mind alludes to the cultural renaissance that I think needs to be fostered even more. It is as essential as economic growth in the betterment of African cities. Lagos is ahead in this regard. What remained in my mind most of all is the immense potential to leverage technology in the service of citizens. EIE – Enough is Enough Nigeria, Sahara Reporters, CCHub, Wennovation, and so many other examples of initiatives that will be integral to helping Lagos youth to engage, have a say and to give back. The role of citizen does not end with a vote – President Barack Obama during his acceptance speech. How can we set up end to end systems that help citizens beyond elections? In the case of Lagos, there is potential of impacting almost 8 million people with information services. I am awe struck by the immense opportunity and hats of to the people already investing their time and energy to doing this. The larger question that I think many cities are trying to answer is how can cities provide services in order to draw the creative, maker, entrepreneurial class? Small and medium sized businesses still power many economies. In Africa, it becomes even more important to invest in growing this segment of the economy. I saw many MTN Mobile money ads, this is likely to be a major growth area for Lagos. I am curious about culture based design in African cities. From architecture of technology systems that can provide utility and help tackle the unique problem sets of Lagos and Nairobi. Perhaps just effective design in a global sense needs to be applied to the many problems of a complex, growing, vibrant city like Lagos. There is lots to learn, but more so, I think there is so much more to do to connect innovators globally to the important problem sets on the ground. The hard work is of course the end to end workflow of making sure we do not just think of the tech, but the Technium and the ecosystems of the future. The most famous example of a truly unique, effective and Lagosian ecosystem is ofcourse Nollywood. Through music and fashion I saw glimpses of even more ecosystems being redefined right now in Lagos.